Tariffs are a tax placed by the government on imports. They raise the price for consumers, lead to a decline in imports, and can lead to retaliation by other countries. They could be a specific amount (e.g. £1 per unit. 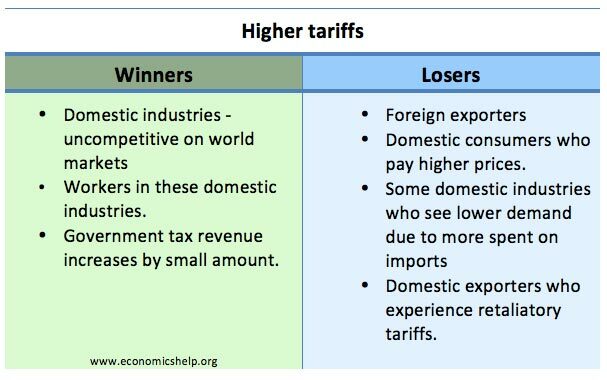 Tariffs are an important barrier to free trade; they are often imposed to protect domestic industry from cheap imports. However, it often leads to retaliation with other countries placing tariffs on their exports. In this case, the tariff is P1-P2. 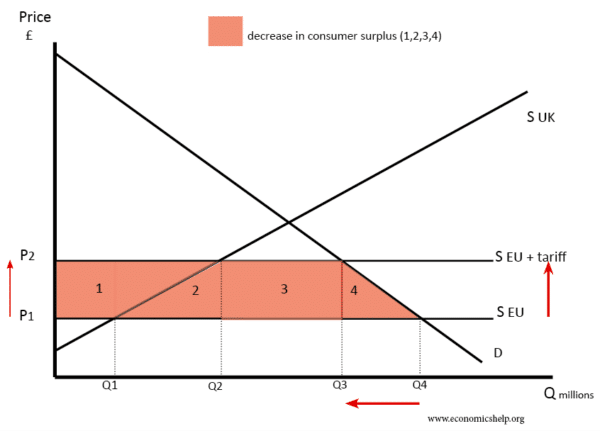 The tariff leads to a decline in imports. Imports were Q4-Q1. After the tariff, imports fall to Q3-Q2. WIth free trade (no tariffs) the price would be £1.20 and quantity bought 60 million. With free trade and no tariff (£0.7 ×20)/2 = £6 million. Environmental. 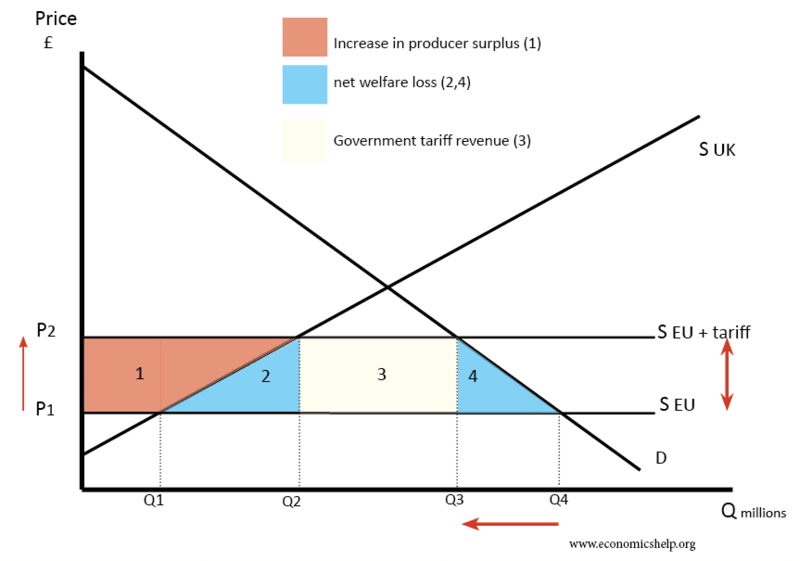 A tariff could be placed on goods who may have negative externalities. e.g. Protectionism. 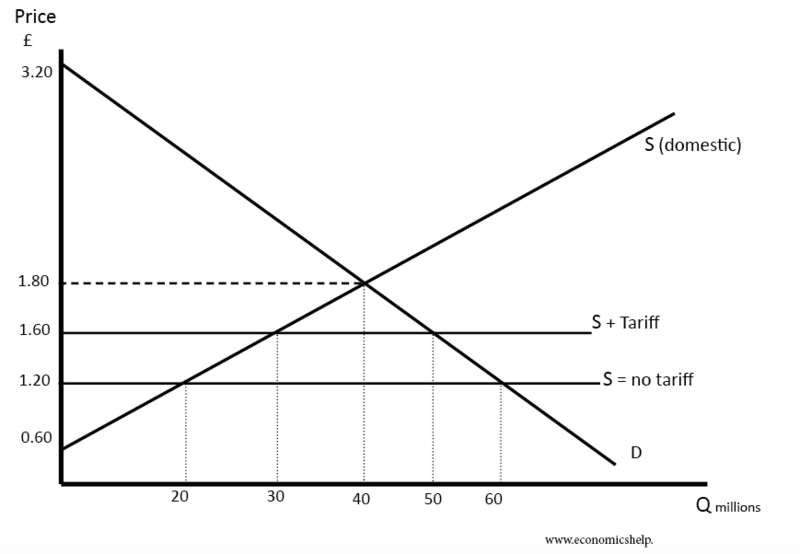 The most common reason for a tariff. Imposing import tariffs makes domestic firms more competitive. Trade liberalisation involves removing barriers to trade such as tariffs on imports. EU has tariffs on many food imports.